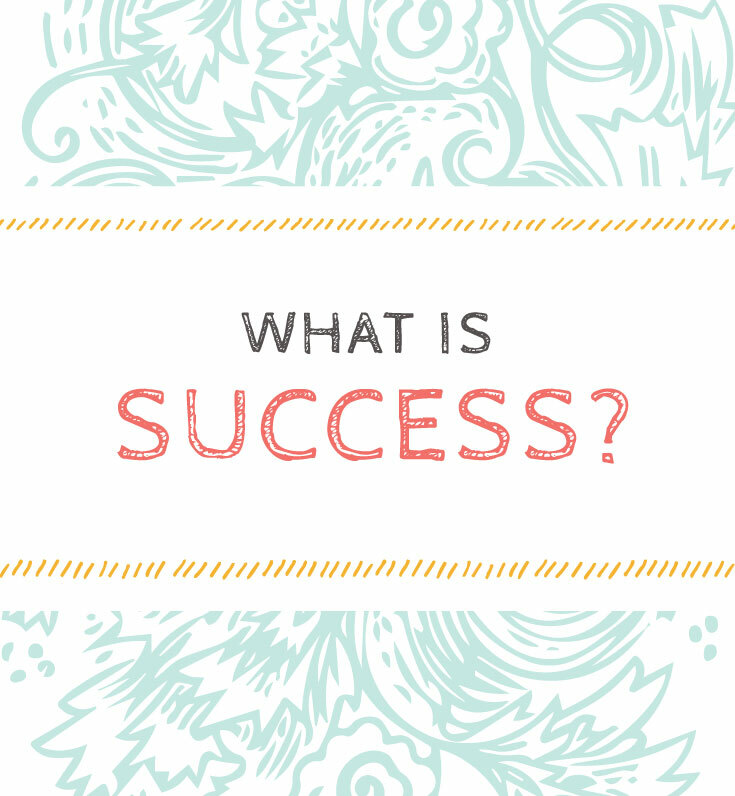 What is success and does it make us happy? I’ve been thinking a lot about the word success. What is success and does it really make us happy? A lot of "successful" people don’t feel fulfilled when they reach their goals. Have you ever achieved a goal and then felt like it just wasn’t enough? Many times we measure success by what we see others doing or by what other’s will think about us. We compare ourselves and then say “They look successful, I want to do that!” This can be good, because it can give us a goal to shoot for, but it also can be dangerous because we loose sight of what is actually important to us. And we forget to embrace the real reason we began doing something in the first place. Are you stuck? Having trouble coming up with ideas for a project? I've found some techniques that have helped me break out of my stuck-ness and I use them with my students. I want to share them with you! This week I wanted to show you one of my favorite drawing exercises that I like to teach. This exercise is great if you are stuck in your head or don't know what to draw. Take 2 or 3 random things and combine them into a drawing! The reason why this is great for your creativity, is because it allows room for spontaneity, randomness and the flow of your creative mind. Very interesting things can happen then, ideas that we might not have even thought of! You want to try not to plan too much or get your thinking/ planning mind involved too much. Your inspiration could really be anything! 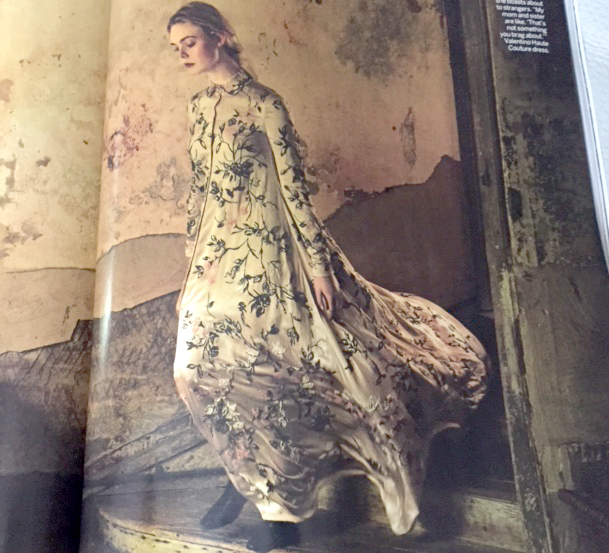 Last week I just happened to get the new issue of Vogue in the mail. I just sat down with magazine and flipped through to see what caught my eye. I first noticed this adorable cheetah. I have to be honest, at first I doubted my ability to draw a cheetah, but I did it anyway. Mine doesn't look exactly like the photo, and that is the FUN of it. Every person's drawing is unique, so don't worry about it not being perfect. Then, I was inspired by the flowers on this dress. Again, mine look completely different because I was trying to stay loose. I also used the lines on the wall as another element. I'm not sure what exactly is going on in this photo but I thought that those bushes could make an interesting addition to the foreground! And there you have it! A fun little exercise to do when you don't know what else to do! I hope this has inspired you to get out the sketchbook and try something new. Let me know what you come up with, I would love to see your combo-drawings! Registration is OPEN for my "Getting Creative with Hand Lettering" e-course! Hand Lettering is a great way to express yourself and create work that will make you stand out as an artist. In this class, you will not only learn how to draw beautiful hand lettering, but do it in your own unique style! This is a week-long interactive course that consists of videos, and two live-streaming Q&A / Show and tell sessions. Sometimes I will post a quick note on my Instagram feed and it will give me an idea for writing to you all. A while back I snapped this picture and I wrote "This is one of my favorite items. 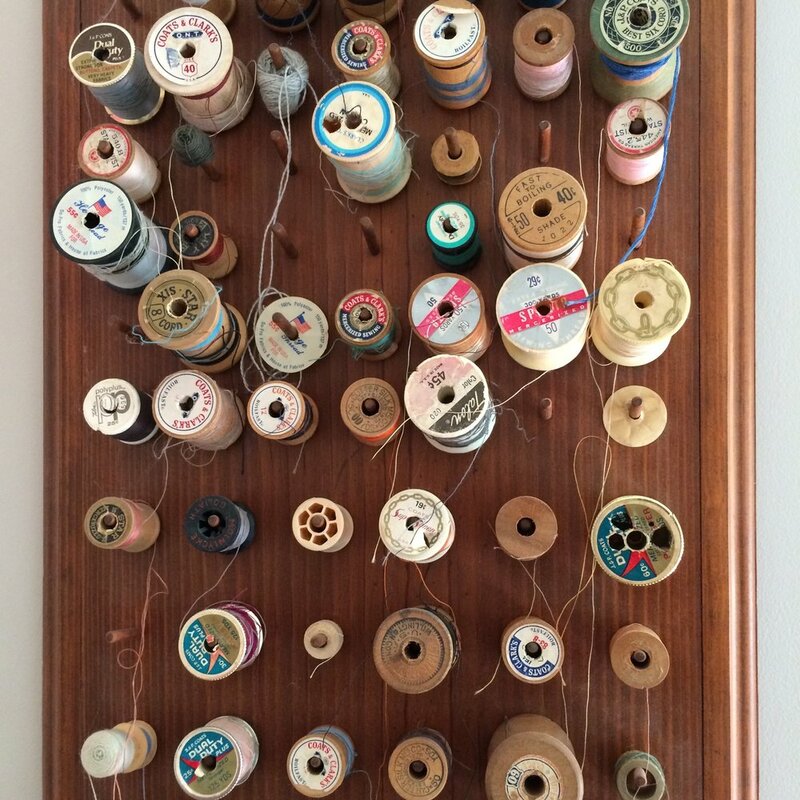 My grandpa made this spool holder for my grandmother's sewing room. I remember staring at it when I went to sleep in that room when I visited them. It now is in my studio, reminding me of the creativity that flows from each generation to the next. It's like a gift that keeps expanding and growing, each generation builds on the challenges, freedoms and vulnerability that the past generations have opened up for us." I was lucky enough to have a family that supported my creativity in many ways. My Grandfather was a woodworker and I have many of his pieces in my home. My father painted with oils and I remember thinking he was he could make anything because he was always coming up with ideas on how to fix things or make interesting creations. In the summer when I would declare "I'm bored!!" He would drive me to the craft store and we would stand in the isle saying "what do you want to make?". Giving a person, especially at a young age PERMISSION to have creative expression is so important. It's a way for us to share a deep part of ourselves with the world and get what's inside of us out. It feeds our soul. And passing down that freedom is truly a gift. What gifts have you given your kids or have you been given? Did someone teach you how to write, bake, crochet or dance? It may have been a teacher, mentor or friend. Maybe your parents weren't supportive of your creative aspirations. Maybe you've had to fight to free yourself from rules of what "art" should be. Maybe you're still working on letting yourself explore that side of your soul. The more vulnerability you can access in this lifetime, the more of yourself you will be able to share with the world and the more free the next generation will be. Like the generations before us fought for civil liberties, some of our parents and grandparents had to work against pressures of social norms to reach the depths of their expression. Sometimes I have students in my class who's parents are designers or artists. It can be incredible to see the amount of knowledge and freedom they have in creating. I honestly get a little jealous of friends who's parents or grandparents were free spirited artists, writers or thinkers. They have an ease in the way they are able to get into an open mode and express themselves. But, it's never too late to step into your legacy. Push yourself past your self-induced boundaries and explore what you are drawn to. It will be rewarding for you, but also for your children, students or friends. I don't have kids but finding this freedom in myself and then sharing what I know with my students is one of the most rewarding things in my life. Who can you give the gift of creativity to? How can you give that gift to yourself and begin to share it? Do you live in the Seattle area? My next in-person workshop is October 21st - just a few weeks away! These workshops are so much fun, it's like a play-date for your Inner Artist! No art experience necessary! Open to beginners or advanced students. You will use techniques such as collage, drawing, journaling and painting in a safe, fun environment. Learn more about this workshop here! Join my newsletter- The Creative Loop! This week I'd like to share with you one of my absolute FAVORITE books for finding your Creative Voice and letting go of anxiety around drawing. The Drawing Mind by Deborah Putnoi is full of short exercises that can help you silence your Inner Critic and explore who you are and how you draw. Even if you haven't drawn in a long time or don't consider yourself an artist, this book will guide you in your journey. Deborah has one exercise that she calls "Deep Looking Drawing". If anyone has done contour drawing before you will recognize this way of seeing and drawing. The guidance is to look at an object and describe it with your pencil without looking at your paper. Try to connect deeply with the essence of that object . Keep your eyes on the object and draw every detail you see with a continuous, loose line and without lifting your pen or pencil off of your paper or looking at your page. As Deborah says, "Trust your eyes, trust your hand". The results can be very interesting. It's a practice in SEEING. We often are so busy with our day to day lives that we don't take time to see and notice all of the incredible details of a plant or our hand. But there are so many interesting things to discover when we take the time. It can help you if you are feeling like you are in a rut, to get out of your thinking mind and explore something new. Help to loosen you up before any creative endeavor. Connect to a deeper part of the world or yourself. It could spark a new idea. Who knows what new path this kind of drawing will lead to. One of my artist friends Jude Buffum creates these kinds of drawings everyday and they've become more and more detailed and developed over time. The results can be unexpected but also, more expressive than anything that we can try to create when we are holding our pencil very tightly and trying to get every detail just right. This allows us a certain freedom that we sometimes lack in our other work. In the book, Deborah uses the Deep Looking technique along with other techniques to help you explore the world around you and inside of you. She builds on each technique and has you use them in a variety of exercises. These images are from a friend who had just undergone surgery to remove a tumor from her pituitary gland. As long as I've known her she has suffered from a variety of ailments and had gone to a myriad of doctors and specialists, no one could figure out what was wrong. Recently, someone suggested that she might have something called Acromegaly, which is when a tumor on the gland causes the growth hormones in your body to increase. She was recovering from her surgery and I gave her this book to pass the time. I was floored by the images that came out of her. There is a prompt in the book that asks you to close your eyes and draw your face. My friend said she said she just drew what she saw, sometimes with her eyes closed and sometimes with them open. When I look at these drawings, they feel so powerful to me. They might not be the way my friend normally draws, but there is something very freeing and relatable in the movement of the drawing. It's as if she is sharing a bit of her soul with us. This way of drawing could lead to a whole new way of seeing and interacting with the world! I encourage you to pick up a copy of The Drawing Mind or just begin Deep Looking drawing or Contour Drawing for yourself. Drop me a line and let me know how it works for you! I'm happy to share that on October 21st I'll be hosting my Finding your Creative Voice Workshop, 10 AM - 5:30 PM at Seattle Re:Creative! If you've been waiting to take this super fun course, now is the time! Take a little time for yourself and go on an exciting journey that will help you to meet that Inner Artist that you might not have known before. If you are living in the Seattle area, I hope you can make it! It's also a great thing to do with friends or family, so why not invite them to come along? THIS WEEK ONLY I am offering 20% OFF my Finding your Creative Voice Workshop - use the code FALLCREATE18 at checkout.